Comet Wirtanen has been giving us a moderate showing this time around the Sun. As it has been closer to Earth than it usually gets, we are enjoying a comet that might just get bright enough by December 16th to see without a pair of binoculars. 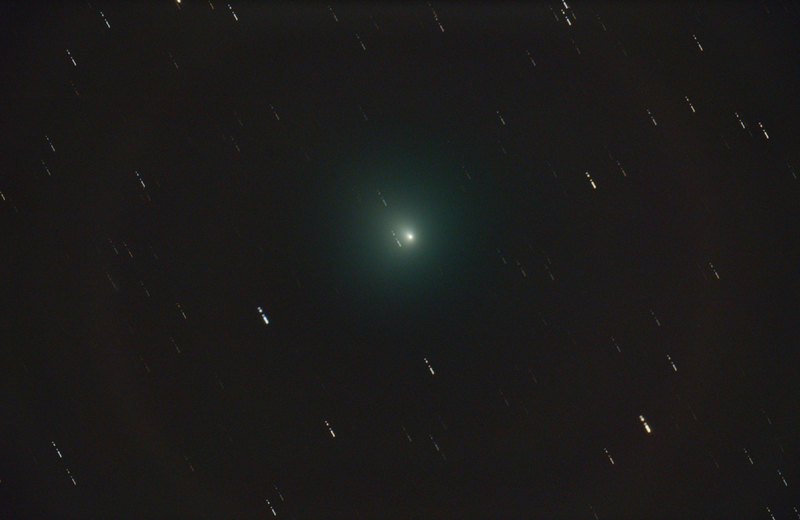 Last night we checked it out through the school’s 16″ telescope and took some images as well. Comet 46P/Wirtanen: One is through the 16″, the other is a wider field view through a telephoto lens. The brilliant green color is striking and caused by the excited gases: cyanogen (CN)2 and diatomic carbon (C2). Usually the real eclipse visibility starts to take place late in the penumbral phase approaching the first contact of the umbra. If you have not seen a lunar eclipse before, it is quite a special event. The moon will appear to have a charcoal chunk missing from it as the eclipse progresses. Deeper into the eclipse, the moon will take on a rusty red hue caused by the sunlight passing through the earth’s atmosphere before arriving at the moon. Telescopes are not required, as one can see the whole event easily with the eye. Binoculars and telescopes will offer a nice closeup view. Photography of the event is a relatively simple affair. A good tripod and telephoto lens will work well with the moderate shutter speeds required. Tracking is not needed. An example of a series of photos I took of the last total lunar eclipse is below. The camera was a Nikon D7000 with 200mm telephoto on a tripod. Click for a larger image. Spring: the time for planets. They’re Back! Now mid-March 2018 and there are planets in the sky! Here are some of the notable moments. If you look to the west right after sunset you will catch bright Venus and fleeting (and fainter) Mercury. On March 18th, just after sunset, you might also be able to catch the very young, sliver moon, low on the western horizon. March 18th 2018 looking west right after sunset. Are you and early riser? Then you will be able to catch the other bright planets, Mars, Jupiter and Saturn. A Casper Saturday: People Arrive! The town of Casper, WY is now hopping along. A lot more people are here today. We started out with a visit to the Geology Museum on the southwest side of things. They have an excellent display on geologic time along with representative minerals and fossils from each period/era. They also have their very own T.rex skeleton, a nice surprise. It is being slowly picked out of the encasing rock…. So, there was a lot of good paleontology to enjoy there for sure! Back into town, the place is swinging. Lots of people wandering about with geeky T-shirts… yes, these are eclipse watchers for sure. The town has closed off the central area for shops to show off their goods, for people to mill about, to have a quick bight to eat/drink, and relax in the summer sun, a hot summer sun, pushing to 90F. The skies today: crystal clear. Absolutely lovely. 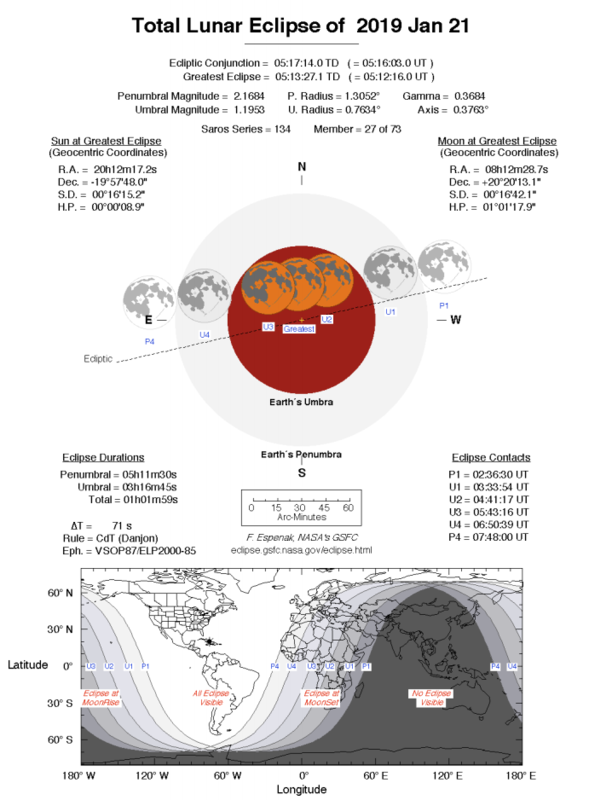 Eclipse Photography – Some Notes for the August Event! Eclipses are exciting whether they be partial, total or annular. On August 21st of this year, the USA will have an awesome opportunity to see a total solar eclipse pass right across the entire country from Oregon to South Carolina. People have already got their hotel rooms reserved, rental cars spoken for, and plane tickets purchased. Wherever you choose to go, you are likely to wonder about capturing this event by camera. Here are some thoughts, in no particular order (but I will try to keep it logical). Never seen an eclipse before? You might want to consider NOT trying to photograph the eclipse at all! Sit back and enjoy the event. Total solar eclipses are short in duration, totality, that is. At the location of greatest totality duration (Southeast of St. Louis, MO), the totality lasts only 2m 40.2s… that is just almost about 3 minutes in length. You really want to be looking up at the corona at that point and making all sorts of exclamations! Determined? You really want to capture this with a camera? Ok! Read on! Start planning NOW. Obtain your gear as soon as possible. This accomplishes two things: You will have the better choice of gear with sufficient lead time. Closer to the event, gear will be more difficult to buy. Also, you will have time to do this next important thing: Practice with your gear now! Learn your camera, inside and out. You want to know ALL there is to know about the equipment you plan to use. Be able to use it without manuals! You WILL NOT have time during totality to learn new things about your gear. Play. Try solar photography on every clear day. Learn what works for you and your equipment now. Some of the coolest looking eclipse shots are wide field images taken with fisheye lenses or wide field lenses to capture scenery and the eclipse at the same time. You can even set it up to take images every couple of minutes throughout the whole event and get a lovely series. A video camera set to wide-field and left attached to a tripod will capture the whole event automatically, and will include sounds of the celebrations around you. Aim, turn on, record. Done. A steady tripod is handy. You might also tape a sign onto the tripod stating “do not disturb”. Check out this video from observers in Queensland for their last total solar eclipse. Individual shots: a DSLR or point and shoot camera should be on a tripod. You can take images at short exposure lengths 1/500s or faster depending on your ISO. This will capture the day-lit scenery and the sun. If the camera is well mounted, be sure to aim the middle of your eclipse series towards the center of the frame. Below is a typical wide field setup: a DSLR with 16mm fisheye on a stable tripod. Note that many new DSLRs also have the capability to shoot video <hint hint>. A Nikon D7000 with 16mm fisheye lens for wide field photography. This will capture good images of the surrounding scenery and the eclipse at the same time. No need for a solar filter here. The tripod keeps it all stable. Below is an image taken with a Nikon D810 at 100 ISO f/8 for 1/640 second exposure. It was resting on a tripod and released manually (i.e. finger on the shutter release button). Shorter exposure times will show less of the scenery, but might show the sun and the corona a little more clearly. This image taken with the setup seen in the photo above, a D7000 ISO100 1/640s f/8 on tripod with 16mm fisheye. If you have manual focus: set it to manual and focus it onto a distant object and then leave it there. Also, set the ISO, shutter speed and f-stops (aperture) and leave it on manual mode. You will then see the surroundings get darker at totality instead of having the camera keep trying to take properly exposed shots in the darkness of totality. Many cameras have built in interval timers. Set it up, start the sequence and go enjoy looking at the eclipse! This gets a little trickier. First and foremost a WARNING: YOU NEED A SOLAR FILTER for your camera and your eyes! DO NOT MESS AROUND HERE. The sun will cause irreversible harm to your eyes if you look at it. It will do more harm more rapidly if you use a telephoto lens without proper filtration! Got it?! Good! This is really important!!! Appropriate filters are those made for solar observing and DO NOT include welder’s glass, exposed film negatives, sunglasses, and similar. Good filter material: Baader Solar Film. You can buy a lot and make a ton of filters for your cameras and friends’ as well. Buy it NOW or you will find it much more difficult to get closer to eclipse date. You can buy Baader Solar Film on Amazon.com. A filter should be placed in front of your lens until just the second before totality. This protects you and the camera and the lens. You can then watch the eclipse as it progresses. I recommend taping the filter onto the lens hood to protect it from being blown off by wind and to prevent interested people from trying to remove it. That is a no no. Throughout totality and into the moment when Bailey’s Beads are visible, you can take the filter off and shoot without it. Experiment with your setup and filters well in advance of the eclipse date. Practice using your camera to take solar images. Do this often. Get to know your camera inside and out. Be able to operate it manually without any guide book. The telephoto setup: a D200 with 300mm telephoto. There is a Baader solar film filter on the front. A right angle viewfinder is attached. This was a windy day! The sturdy tripod helped a lot. Tripod: You need one with telephoto lenses. You need a sturdy one. The sturdier, the better. For a 300mm lens on a full frame (FX) camera, I use a Manfrotto MT055XPRO3 055 Aluminium 3-Section Tripod with Horizontal Column. There is also the issue of the tripod head. I use one with slow motion controls, also a Manfrotto item: Manfrotto 405 Pro Digital Geared Head. These are not inexpensive items! Whatever you use, the ability to slowly move the pointing as the earth rotates is very helpful. It just has to be stable as a rock. A word about tracking: Some of you will be tempted to go find an astronomical tracking mount for this event… thinking that you can mount the camera onto the mount and just let the thing track through the event automatically. If you have not done this before, avoid the temptation. A good tracking mount is much more expensive, as it has to be massive to hold your lens and camera combination. Alignment with the earth’s rotational north pole is not easy in daytime. You will need batteries or another power source to drive it. Just no. It is EASY to manually track the sun in a camera’s viewfinder. Keep it simple. Travel lighter. Save money. If you’re a pro and plan on doing this, then you already know what you are up against. No need to discuss this any more. Lens: A DSLR and a telephoto from 300mm up will be great. 300-400mm lenses are more than adequate for some excellent photography…. There is no need for a massive telescope with 8” open aperture and 1200mm of focal length. The sun is bright. The sun is also large at some 0.5 angular degree in diameter. If you use a zoom lens, be sure that you can lock the zoom feature. Use duct tape if it does not have a locking feature. Some of them will zoom in or out on their own due to gravity! Not fun if you are trying to keep things equal throughout the event. Camera: The camera will be better if it has manual controls and manual focus. Having a remote shutter release is good in that it will reduce vibrations. Setting focus: With the solar filter on, focus on the edge (limb) of the sun until it is crystal/razor sharp. You might even have a couple sunspots to focus on. Most camera’s autofocus systems will do this nicely. Once focused, switch the camera and lens to manual focus and DO NOT touch it throughout the event. If your camera has mirror lockup mode, you can use that if you wish to reduce more vibration, but you will have to look through the viewfinder occasionally to center the sun, and that requires a mirror. I never bothered with the mirror lockup feature for eclipses, and my images were fine. Why setting to manual? You should expect to change the shutter speed and maybe even the aperture throughout the eclipse in order to get best exposures. The moon covering the sun will dim the event, little by little. As totality is reached, you will want to try to capture the inner corona and flares/prominences with short exposures… and then use longer exposures to capture the outer corona, requiring longer exposures. You will be VERY busy at totality. A Nikon D810a with 200-500mm zoom, right angle finder and home made Baader film solar filter. This is the limit for the tripod before things get too shaky. Add a GPS receiver and remote shutter control, and this is a perfect setup. The working end of the D810a and massive zoom lens. The right angle finder allows one to be looking away from the sun while taking photos. Add the shade of a rimmed hat and the extended cardboard from the filter assembly, and taking solar photos is a snap! File Types: Most modern DSLRs, and digital cameras in general, allow one to select various modes of shooting: High, Medium, Low resolution, Raw, NEF, etc. My recommendation is to have your camera shoot both high resolution Raw images and JPGs as well. Depending on your camera make/model, this will result in raw images of type NEF, RAW, or CRW and also store JPGs. These raw images can be edited much more cleanly than JPGs. Images will be large! Have memory to handle this. My last eclipse trip saw 350 images in all from eclipse start to finish. Also turn off any compression modes and image processing (sharpening, etc) that cameras are likely to do. Set your camera’s time and date as accurately as you can using Universal Time. If you have a GPS attached, then this will be taken care of for you. Totality: Much has already been written about what you can expect to see during totality. You have to decide what you are going to do, and in what priority. Some will want to just look up and enjoy. Others will want to take as many photos as possible. Assuming you are going to take as many photos as possible, read on. Right before totality, you have the option to remove the filter and try to capture Bailey’s Beads. With the camera on high-speed multiple exposures, take as many images as you can, as fast as you can. You can also get the Diamond Ring Effect if your timing is good. Another option here: try to get both the beads and the ring effect at the END of totality. It happens on both sides! Take many photos at many different exposure times. Long exposures will show the outer and fainter corona. Shorter exposures will show the brighter inner corona and prominences. If you take a series of images with a wide range of exposure values, then you can combine them using high dynamic range software to get some amazing imagery. Gadgets: Below listed are some helpful things to have around. Not all are necessary. Take what you think would be helpful. GPS receiver/geotagger attached to the camera: these can log your position and the time onto each image you take. Great if you are doing science or working with the Mega-Movie-Photo-Team. A right angle viewfinder for the camera: this is really helpful, as it allows to look down into the camera viewfinder instead of at the same line as the sun. Combined with a brimmed hat, this is a really nice gadget to have. Some also have 2x magnifiers which help with focusing. Extra Memory Cards for the camera. Pencils and pens and notebook. Maps: in case you need to avoid weather, having a paper map of the area is helpful. Bug spray: sometimes bugs can really bug you! Mosquitoes will come out in at totality. Sunscreen: yep – sun burns are no fun. A brimmed hat: this helps to block sun from your seeing the camera’s field of view properly. A vest with a ton of pockets: to hold tools, parts, lenses. A pocket knife (Swiss Army style with tools): handy to attach tripod screws to camera and many other things. Duct tape: there is always a need for duct tape. Plastic bags: to cover camera and gear against rain and dust. Water and food: keep yourself energized and hydrated. Microfiber cloth and lens dust-off-bulb: helps to clean the optics and the viewfinder window. Your glasses and or contact lenses. Have an extra set. Solar eclipse glasses. These are fun and allow you to see the eclipse with the unaided eye while it is in the partial phase. An odd one: Permission to be where you are located! Be mindful that it will be easy for you to be tempted to trespass onto lands for which you do not have permission! In case you do venture onto unknown property, bring photo ID with you. The Eclipse Mega Movie Site. Interested in making some history? Submit photos as part of this team. The NASA Eclipse 2017 website. The NASA August 21, 2017 specific website. AstroSolar.com’s site on making your own solar filters out of Baader solar film. Thanks to the fine carpenters at the Academy, we now have our Sloan Digital Sky Survey (SDSS) plate mounted and hanging on my classroom wall. It has been encased in a wooden box filled with ornamental lights, giving it that astronomical view. The SDSS Plate in its display case. Note the markings which help astronomers identify the various targets. Information on the plate itself is rather interesting. This is a plate for the Baryon Oscillation Spectroscopic Survey (BOSS) which has the goal of mapping baryon acoustic oscillations signatures by looking at the spectra of some 1.5 million luminous red galaxies. The survey will help astronomers to place limits on the universe’s expansion rate, and more! The plate here was used to hold optical fibers on the SDSS telescope’s focal plane so that each fiber, attached to a hole on the plate, captures light from just one galaxy. That light is then funneled down the fiber optic path to a spectrograph. The plate has a bunch of markings on it to help astronomers with the data collection process. Fiber optic bundles are grouped together such than each bundle gets a section of the plate bounded by a black border. Blue circles around the openings correspond to the galaxies locations for which spectra are being collected. The black circles around the holes correspond to guide star locations in the field. This is the SDSS field of view for this specific plate. Click on this image to go to the SDSS Navigate tool and have a look around! The magnetometer is now installed and running in a test location at the observatory. Both raw data and a continuous plot of data are available online at: http://regulusastro.com/magnetometer/ This URL is likely to change as things become more permanent. At this time, the data correlate well with other magnetometers. We are waiting for a couple of other installations in southern NH to complete before we are able to test thoroughly and make this available for scientific use. Stand by for that! A typical data plot is below for a quiet day. The green stripe along the bottom indicates quiet conditions. As geomagnetic activity increases, the stripe will turn yellow then red when the K index hits 6 or more.